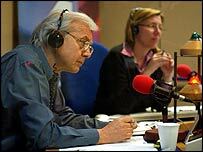 BBC Radio 4 Today's presenter John Humphrys has been censured by the BBC over comments he made in June about politicians in an after-dinner speech. An inquiry, ordered by chairman Michael Grade, into comments reported in The Times newspaper found they were "inappropriate and misguided". The speech included remarks about Tony Blair, Gordon Brown and John Prescott. The Today host has undertaken to adhere to the BBC's policies and values and no further action will be taken. The BBC concluded his comments could be used to question his and the corporation's impartiality. In a statement, the corporation said Humphrys, 62, accepted some of his phrases were "injudicious" and as a presenter it was vital he was seen to be impartial. The Times reported Humphrys said in his speech the BBC "got it right" in a controversial report that claimed the government "sexed up" intelligence in Iraq's weapons capabilities. This report, by Andrew Gilligan, sparked the Hutton report which led to the resignation of director general Greg Dyke and chairman Gavyn Davies. The BBC subsequently apologised to the government for the allegations. Humphrys said it was a "gross misrepresentation" that he had called politicians liars and added he had not said anything he had not said before. Director general Mark Thompson said the presenter was "widely admired by the public for his vigorous and forthright interviews with politicians and others". Mr Thompson said he was satisfied there was no political bias or lack of impartiality in the speech. "However, some specific remarks were inappropriate and ran the risk of calling into question John's own impartiality and, by extension, that of the BBC," he said. "We've made it clear to him that this must not happen again." Mr Grade said he was "satisfied" by the conclusions of the report and was "pleased to draw a line under this episode".